More and more novice investors are turning into precious metals market as the only capital refuge available in turbulent economic times. However, if you have never purchased gold coins before, there’s so much to consider. 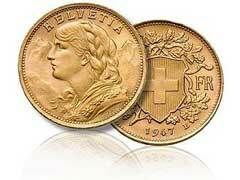 Should you be buying German gold coins, American or Swiss gold coins? Which ones will provide you with the maximum investment potential? Perhaps, you should turn into buying gold bullion bars instead of Swiss gold coins? All these choices might make some head spinning decisions; we will try to break it down for you to the basics of gold investing. Swiss gold coins have earned admiration of gold investors all over the world due to their exceptional quality and fineness. Gold proof coins or gold bullion coins? Definitely, gold bullion coins make the most solid and sane investment decision. In case with proof coins, you will end up paying more money in the end due to their numismatic value, limited mintages and other “irrelevant” for gold investing stuff. Swiss gold coins or gold bullion bars? Definitely, bars since they provide the most cost effective solution for gold investors. If you compare the price for 1 oz bullion coin vs a 1 oz gold bullion bar, you will notice the difference right away. The extra savings come with lower manufacturing expenses and generally lower premiums on bars vs coins. For example, Credit Suisse gold bullion bars are minted from 24 karat, the purest form of gold, and are considered one of the best types of investment into precious metals. Another excellent choice when it comes to quality gold bars is Pamp Suisse gold bullion bars made from 24 karat gold and weighing one or 10 ounces each. To ultimately maximize your gold bar investment, consider purchasing several bars at the same time to save even more investment funds on premium charges. If you qualify, you can even take advantage of wholesale Swiss gold bullion pricing offered by some vendors if you meet the minimum purchase requirement.